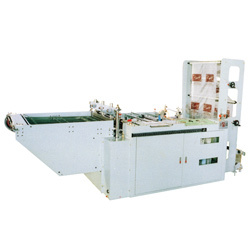 Jin Chang Plastic Machinery Co., Ltd.
1. Equipped with one set photo-scanner. 2. Multiple operation process indicator. 6. Epc (edge positioning control). 1. MAX, cutting width: 18". 2. MAX, cutting length: 40". 3. Thickness(mm): 0.009~0.15. 4. Length tolerance: ±1mm. 5. Production. PER. MIN. (PCS): 36~150. 6. Driving motor (AC): 1HP. 7. Heater capacity: 1.8kw. 8. Power required: 2.8kw. 9. Dimension LxWxH(cm): 340x115x155. 10. Machine weight (kg): 650. 11. Measurement LxWxH (cm): 225x125x170. 12. Gross weight (kg): 800.